The Adult Mental Health Outpatient Services offer a broad range of services and treatments as appropriate to clients over age 18 who are living with mental illness. Services include intake assessment, counselling, occupational therapy and social work support. Inter-professional care teams work collaboratively with hospital and community addictions and mental health teams. Specific treatment options include Electroconvulsive Therapy (ECT) and Transmagnetic Stimulation (TMS) with medical referral, as well as support for clients with Community Treatment Orders, and/or clients with a primary diagnosis of severe/persistent mood disorder with treatment resistance or other complex needs. The Seniors Mental Health Outpatient Service provides inter-professional outpatient services to clients with late-onset mental health, cognitive and/or responsive behavior issues. Initial assessment is provided in a client’s home by the case manager, followed by clinic appointments at the hospital with a physician. The Mood Disorder Service supports adults with a primary diagnosis of severe and/or persistent mood disorder with treatment resistance or co-morbidities. It is a specialized, non-urgent service for patients with severe or persistent mood disorders. Consultation and short term follow up are provided. Regional Outreach – Specialty Mental Health supports adults 18 years of age or older with stable moderate to severe mental illness of at least two years duration. Last psychiatric admission must be greater than 6 months prior to referral and client must have an established contact with a family physician. The service provides an intake assessment, supportive counselling, occupational therapy and social work support. Goal is to transition stable patient’s care back to the family physician. The Acquired Brain Injury Clinic serves patients 16 years or older with an acquired brain injury. The ABI Clinic provides an initial consultation with a Physiatrist to assess the severity and complications of an acquired brain injury, providing treatment and making referrals for appropriate assessments and treatment. The Adult Seating Clinic supports disabled adults with complex seating needs that cannot be met in the community or by inpatient therapists. The clinic includes Occupational Therapists and local vendors, and provides an initial evaluation of the seating needs of the clients, recommending appropriate wheelchairs and commercial/custom seating products. The Amputee Rehabilitation Service/Clinic meets the needs of clients with congenital or acquired limb loss and those considering elective amputation. This clinic provides two separate services: an active rehabilitation for those patients who are deemed ready to train with a prosthesis, as well as a coordinated inter-professional assessment and follow-up service. The Continence Clinic provides outpatient services to individuals over 65, who are experiencing urinary incontinence issues. Inter-professional assessment, diagnosis and treatment are available. The Electromyography (EMG) Clinic is open to patients 13 years of age or older with suspected peripheral nerve and muscle disease or injury. Clinical diagnostic services in combination with peripheral nerve conduction studies and needle EMG allow assessment of nerve and muscle damage. The Geriatric Medicine Clinic supports high risk, frail elderly patients with co-morbidities as well as memory and/or cognition issues. The Clinic offers inter-professional assessment, diagnosis and stabilization to frail elderly patients and family. The Memory Clinic (within the Geriatric Medicine Clinic) provides inter-professional assessment, diagnosis and recommendations for patients with memory and/or cognitive disorders. The Musculoskeletal Clinic is open to adult patients with acute or chronic spinal or limb pain. Clinicians provide assessment for musculoskeletal injuries (pain of muscles, tendons, ligaments, joints and bones) and spine pain (low back pain, neck pain). The Neuromuscular Clinic is appropriate for patients experiencing mobility, respiratory and/or cardiac consequences or complications due to their neuromuscular disease. Inter-professional assessment, education and monitoring are included. The Neurorehabilitation Clinic is open to patients with a medical referral due to neurological disorders including Multiple Sclerosis. The Clinic provides assessment, education and symptomatic management of complications in neuromuscular diseases. The Respiratory Rehabilitation Clinic supports patients experiencing shortness of breath due to COPD, asthma, lung disease or lung surgery. The Clinic offers assessment of patients who are experiencing shortness of breath due to lung disease to determine their eligibility to participate in the Respiratory Rehabilitation Program. The Spinal Cord Injury Clinic supports patients 16 years or older who have spinal cord disease or spinal cord injury. The Clinic team provides assessment and management of consequences and complications of spinal cord disease or injury. The Stroke Clinic is open to adult patients who have experienced a stroke. The Clinic offers assessment and management of stroke related impairment, disability and complications. The Accident Recovery Centre (ARC) serves clients who have been injured as a result of a motor vehicle accident with an active claim and approval from an auto insurer. Physician referral is required. The ARC offers inter-professional, individualized assessment, injury-specific treatment, functionally oriented exercises, education and prevention with the aim of restoring clients to their pre-accident status. The Occupational Therapy Musculoskeletal/Neurological Service is designed to optimize independence in activities of daily living including self-care, productivity and leisure. Referrals are accepted for patients with a variety of musculoskeletal or neurological conditions. Therapists meet with patients to assess their level of function in activities of daily living, make recommendations for equipment, strategies and adaptive devices and educate the patient and significant others. Physician referral required. The Physiotherapy Musculoskeletal/Neurological Service provides Physiotherapy intervention to improve strength, motor control and balance to improve functional mobility with an emphasis on education, prevention and self-management. Physician referral required. The Respiratory – Airway Clearance Service provides assessment of patients who are experiencing sputum clearance issues. Provides teaching of airway clearance techniques. The Respiratory Rehabilitation Service is open to patients with Respiratory Disease with functional limitations and shortness of breath. Patients should not be experiencing cardiac or orthopedic issues that would preclude intensive exercise. Participants must be motivated to participate and have quit smoking or making significant attempt to quit. Patients must be able to attend the clinic 3 times per week for 12 weeks or 3 weeks full time as an inpatient. This service promotes the concept of disease self-management by providing assessment, treatment, inter-professional education and follow-up to patients with respiratory diseases who are optimally medically managed and who continue to experience functional limitations and shortness of breath. Appropriate candidates are those with the potential to adequately improve functional loss in avoidance of repeat Emergency Department visits, inpatient admission or admission to long term care. 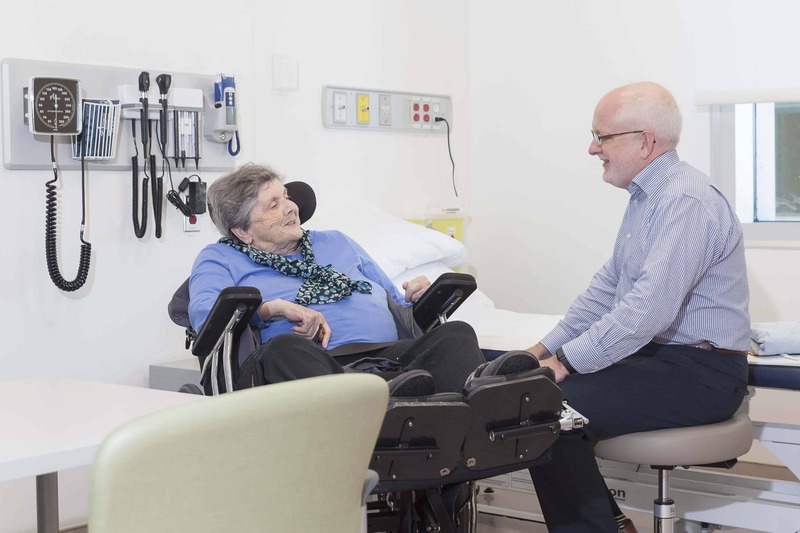 Patients may come from hospital or the community directly but no longer require nursing care, are able to be managed at home and live close enough to be able to participate in ambulatory services. Patients requiring greater than mild to moderate assistance with toileting or transfers, exhibiting wandering, exit seeking or aggressive behaviours are not appropriate for this service. Seniors Day Rehabilitation offers inter-professional assessment and intervention for community-dwelling seniors who have experienced a recent functional loss or decline in coping and/or managing day to day activities. Evidence based care includes the provision of time-limited, inter-professional therapeutic services two to five times per week for cognitive needs, continence, self-care, mobility, nutrition and swallowing, chronic disease management, driving concerns and secondary prevention. The Speech Language Pathology Outpatient Service is open to clients 18 years or older with an acquired neurogenic communication disorder. The Service provides assessment, therapy, education and counseling for adults who have an acquired communication impairment with the goal of improving the patient’s functional communication in his/her environment. The Vestibular Rehabilitation Service supports adult patients diagnosed with vertigo, motion sensitivity, imbalance and/or gaze stability impairments secondary to either a peripheral vestibular deficit or central cause such as traumatic brain injury.